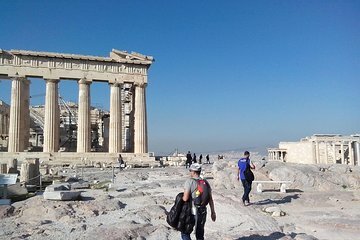 Se de bästa delarna av Aten, inklusive Akropolis och parlamentet, besök de drömmande öarna Mykonos och Santorini innan de återvänder till fastlandet. Denna turné balanserar landmärken, gamla monument och modern historia. Det finns också massor av stillestånd att kolla på de vackra stränderna. Denna korta och intensiva turné är perfekt för dem som bara har en kort tid i Grekland. This is a great way to see Greece in a short amount of time. Our driver, William, in Athens was excellent--he would tell us about each attraction and then we explored them on our own. We was kind, patient, thoughtful and knowledgeable. The company was generous-we were unable to go to Mykonos even though it was supposed to be part of the trip (Ferry would not go there in the off season), they made up for it by upgrading a number of aspects of our trip (nicer hotel suite, first class on the ferry etc.) I would recommend this attraction to anyone (and already have!). This tour was for the most part pretty good. The only negative part of this tour was the SeaJet2 ferry that was 2 and half hours late in picking us up on a Saturday. The majority of the passengers ended up throwing up because the water was so bad. We arrived back at Athens from Santorini at 3:00 AM Sunday morning. We missed our tour due to ferry being late picking us up and i am still trying to work on getting a refund. I would recommend that the company offer an option to upgrade or change the ferry with a fee as i will never ride the SeaJet2 again. In addition, provide hotel information ahead of time as i was provided the itinerary when i checked in to my initial hotel in Athens Greece.